"A little something extra just for you." Let's face it. No matter how much you enjoy driving, there comes a time when you wish you could relax and "Leave the Driving to us". No, I'm not suggesting you take a Greyhound. But sometimes it's fun to see a new city without having to worry about parking and traffic. That's why trolleys have caught on in a big way. Perhaps, you are visiting Chattanooga with your children. Or maybe you are in Macon Georgia for a convention. These are only two of the many cities that have embraced trolley service for a multitude of reasons. Chattanooga had earned the reputation "Dirtiest City in America" in 1969. Recently the Washington Post referred to it as "becoming the prettiest city for its size in America." Its electric trolleys are one of the reasons for the change. You can hop on a free trolley near almost any hotel downtown. The kids are going to think of it as an attraction in itself. For you it frees up the attention you would otherwise have to devote to negotiating traffic and finding parking. Instead you can explain that the aquarium is the largest freshwater one in the country. You can explain the history of the Chattanooga Choo Choo to youngsters too young to remember the song. You can pretend you are at a quaint tearoom in London when you visit the English Rose Tea House. The owner, Angela Beckvoort is as English as the scones you can sample there. The Science and Discovery Museum is also on the route as is the Towing and Recovery Museum. In fact, most of the city's downtown attractions are no more than two blocks from the trolley line. In Macon, Georgia, it's Mitsi to the rescue. Mitsi makes continuous loops through the downtown historic district. So when you get a break from business meetings, you can pick up a pass for a few dollars at the Convention and Visitors Bureau for unlimited boarding or just pay a quarter per ride. You can visit The Georgia Music Hall of Fame, Tubman Museum, Hay House, Georgia Sports Hall of Fame or any one of the house museums for which Macon is famous. The drivers are knowledgeable about the various attractions and the history of the city. If historic Savannah is your destination, their free CAT Shuttle does an intricate weaving throughout the historic district. It makes stops at or near most of the major hotels and bed and breakfasts throughout the district.. From the River Walk to the Pirate's House, this is the way to transverse Savannah's historic district. Daytona Beach has the Votran Trolleys, a turn of the century type bus that operates along the beachfront Monday through Saturday from noon to midnight. The trolley will whisk you from one end of Atlantic Ave to the other in a much shorter time than you could drive and park. The one dollar fare for adults (half for seniors and children) could be the best bargain on the beach. Ask anyone who has driven congested thoroughfare during race week. Worried about celebrating too much for new Years Eve? Votran waives fares for New Year's Eve trolley and night service beginning at 7 p.m. Dec. 31. New Orleans has some of the most original trolleys. 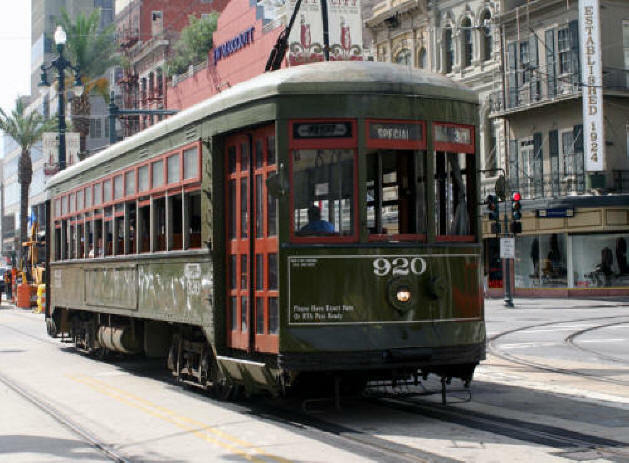 There are three streetcar lines; St. Charles, Canal Street, and the Riverfront, each of which originates downtown but takes you different parts of the city. The St Charles line is my favorite. I remember riding it as a kid. My dad actually was a driver on the streetcars when I was a little child and each year the Public Service had a party for employees and family. One of the most popular things was the old streetcar we could play on and pretend to drive. If your travel is politically oriented, fear not. If you visit the nation's capital area and stay in Bethesda, Maryland, you can live it up and not worry about driving. The Bethesda Circulator is geared for nightowls as well as early birds. The original trolley only ran days. Now it runs until midnight Monday through Thursday and until 2 am on Friday and Saturday. Former Maryland Governor Parris N. Glendening commented. "The Streets of Bethesda don't roll up at 7pm, and neither will the Bethesda Circulator. This innovative trolley service will provide convenient transit for people who live and work in Bethesda and those who visit for shopping, fine dining, and entertainment." In Florida's capital, Tallahassee, it's the Old Town Trolley. It will pick you up for free at a convenient downtown stop froim7 am to 6:30pm every twenty minutes. In Austin, Texas, the trolley is named the 'Dillo in honor of the slow witted armored fellow you have been trying to avoid hitting on every highway in the southern United States. This free period reproduction shuttle will take you to the Capital, the University of Texas or to most of the downtown tourist hotspots as well as great restaurants. Of course, Arkansas can't be left out where progress is concerned. 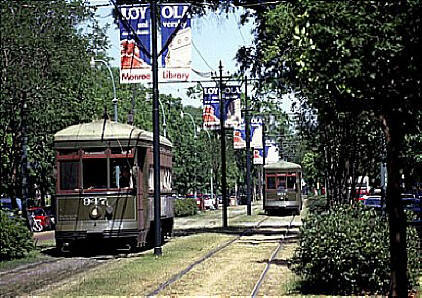 The River Rail Electric Street Car Trolley encircle downtown Little Rock and connects with North Little Rock. They are replicas of historic streetcars. If you have a special interest, you may even find a trolley that caters to it. Pensacola offers free trolley tours of its seaport in season. It does stop running before the bars close down however. Genealogists visiting Salt Lake City have the Pioneer Trolley to get to the Family History Library, the largest repository of genealogical records in the world. Sometimes you have to be there just the right time. Martha's Vineyard provides a weekend of service just before Christmas. Neenah, Wisconsin offers free rides on an old fashioned shuttle for just one day at the start of the Christmas season. Marblehead, Massachusetts and LaGrange, Illinois offer free trolleys for their annual Christmas Walk. The holiday season brings out some special trolley tours. 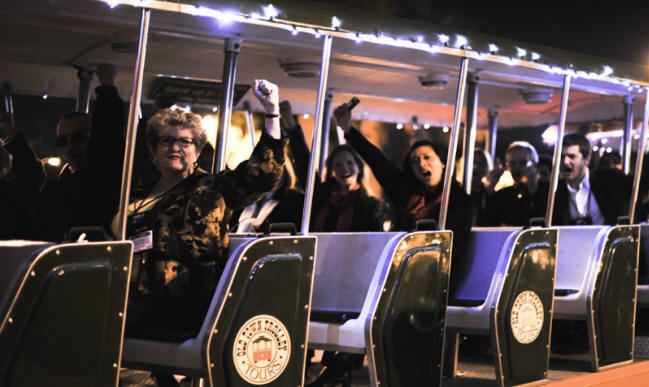 St Augustine offers the Holly Jolly Trolley for tours of its highly acclaimed "Night of Lights" from late November to early January. Cookies, caroling and other treats add to the fun. Pittsburgh runs their Victorian style Holly Trolley from mid November until the last shopping day before Christmas from Thursday through Sunday. Hosts are on board to point out the festive decorations and activities along the route. 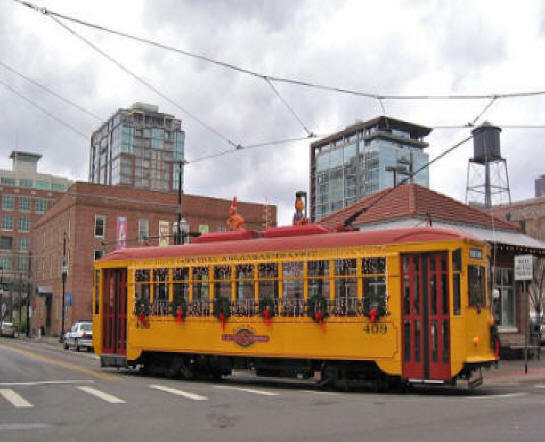 Franklin, Tennessee offers a Holly Trolley most of December. If you are going to a historic or tourist oriented destination be sure to check for trolleys too. Chicago offers its Lincoln Park Trolley to encourage people to visit the zoo. If you want to see Williamsport, Pennsylvania's lumber barons' Victorian homes, you can do so via its free vintage trolley. Port Aransas, Texas near Corpus Christi offers old style trolley service all around the island. If you're staying on the mainland, you can also use its free ferry service. Downtown Houston has cut down on its congestion by offering five free trolley routes. 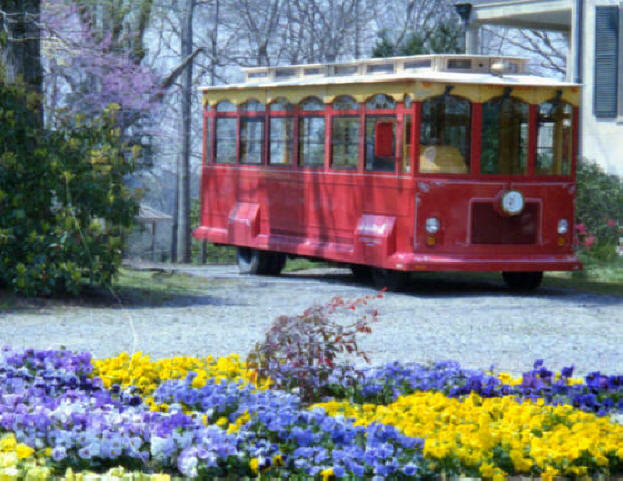 For those of you who really love trolleys, Pennsylvania Trolley Museum has a collection of nearly 50 trolleys and all sorts of information about trolleys. It has over 30,000 visitors annually so you know people do like trolleys. Cities as far apart and different as Yorktown Virginia, West Palm Beach, Florida and Portland Oregon all have caught on to the latest transportation service. I know Ihaven't mentioned them all. So whatever your reason to travel, make life easy on yourself. Step back to a time when people didn't have to worry about traffic and parking problems. Take a trolley. Had you ever stopped to consider a beautifully decorate Christmas Tree as a work of art? Orlando Museum of Art has and each year they offer some of the most beautiful trees in their annual Festival of Trees. This year's theme is "All That Glitters" and will run from November 16th - 24th, 2013. The tree's beauty defies description so I'll post lots of pictures to give you an idea. But the best thing you can do is go see for yourself. you enter the Fesitval of Trees This one is called "Oh My Glitter"
and boy does it ever. Easy to see why this one is called "Pepperment Twist"
This is the 27th year the event has run. It is a project of the Council of 101 and the museum's main fundraiser. This huge gala transforms much of the museum into a holiday wonderland filled with theme decorated trees. Individuals and businesses decorate a tree in whatever theme they choose and donate it to the museum where they stay on display and are offered for sale until the end of the festival. Buyers then have a completely decorated tree that they take home after the festival. There are more than trees at the festival. The Gingerbread Room is filled with all manner of gingerbread houses. When you walk into that room, you want to devour everything in sight. The smell is sooo delicious. works are under $100 This looks more like a gingerbread castle than a house. Another glistening room offers table settings that just scream "Merry Christmas." Some are simple and homey and others elegant. It includes all the holiday traditions too as there is a interesting Hanukah display. Items for a silent auction sit temptingly in view in one hall.There is a toy shop to delight the kids and a gift shop to give you a helping hand with your Christmas list. Naturally Santa has his own spot where he can visit with all the good little girls and boys. Each day of the festival offers different events including cocktails, dining, a silent auction, musical and dance entertainment. What a way to warm up for the Holidays!